Published on 20 September 2012. This is a memorial fountain designed by James Woodford in 1954. 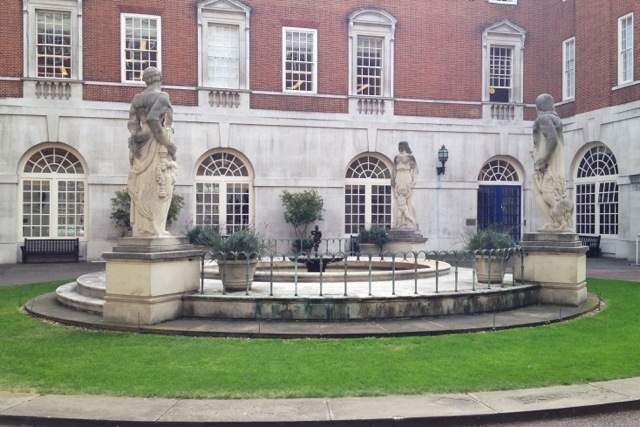 It stands in the courtyard at BMA House, commemorating doctors killed during the Second World War. James Woodford served in both World Wars, with the the 11th Battalion Nottinghamshire and Derbyshire Regiment (Sherwood Foresters) in the First, and with the Air Ministry in the Second. He won the Prix de Rome for Sculpture in 1922, and went on to create his best known work in 1953: ten heraldic beasts which stood at the entrance to Westminster Abbey for the Queen’s coronation. Now, I’m sure we’ve all experienced one of those awkward moments after a big party when you suddenly think, “Damn, what on Earth am I going to do with all these decorative heraldic beasts?” I know I have! Well, luckily, Woodford had the foresight to plan for that moment, and made them only out of plaster so that they could be easily thrown away. But – shock horror – the beasts turned out to be very popular. So popular, in fact, that he had to do a nifty bit of negotiation with the Home Office to get a 50:50 split on the takings from the rights to copying them. And to this day, you can see a complete set in the Royal Botanical Gardens in Kew. This 1,817th post was filed under: Photo-a-day 2012, London.